What’s Growing at the Harriet Irving Botanical Gardens: Reading Locally Within the Acadian Forest Region! The Grapevine > Articles > What’s Growing at the Harriet Irving Botanical Gardens: Reading Locally Within the Acadian Forest Region! Not long ago, I had a wonderful opportunity to visit the Coastal Maine Botanical Gardens (CMBG) in Boothbay Harbor, Maine. The coast of Maine was my childhood home, specifically Bar Harbor, where my parents and the beautiful landscape of Acadia National Park built my foundation as a budding naturalist. As life likes to guide us through complete circles, I smiled as I cycled onto the grounds of the CMBG wearing my horticulture assistant/educator hat from the Harriet Irving Botanical Gardens. Don’t worry, I certainly had my helmet on too! The four seasons I have spent alongside Melanie in the Gardens have taught me so much about the plants I have known and loved my whole life. Not only is their diversity stunning, but the intricacies of their relationships to each other and their surrounding habitats is nothing short of magic. Nova Scotia has become my beloved home and approaching the CMBG Visitor Centre felt like the closing of a loop. The time had come to look at my childhood landscape with new eyes, focused on what the CMBG offers to their local community and in turn, rediscover how much the work we do on our 6 acres in Wolfville supports the growing body of knowledge of the Acadian Forest Region. No two botanical gardens are the same, and at first glance the CMBG couldn’t be more different from our local gardens. There are shuttle carts to help move visitors around the nearly 300 acres of the grounds, a landing dock for boat tours, lots of exotic annuals, perennials and trees, hundreds of people at any one time wandering the paths and a staff of over 100 (plus close to 400 volunteers) in the summer season! Beyond that however, we are completely identical: youthful as botanical gardens are concerned (the CMBG opened in 2007, just 5 years after we did! ), excited, and welcoming to every visitor, and each staff member carries a tangible awe and respect for the plant kingdom in its diversity. Then there are books: lots and lots of books! Melanie and I have hundreds of books stacked precariously on bowing shelves in our office. They are well-thumbed and used constantly. Our E.C. Smith Herbarium is filled with publications new and old alike, an incredible resource that I can get lost in for hours. As I toured the educational facilities and offices of the CMBG I couldn’t help but notice how many darn books there were that I had never, ever seen before. Field guides, manuals, and surveys, full colour, glorious, and beautiful books completely devoted to plants. Several of which were written by their CEO and director, William Cullina. His publication, Wildflowers, lives in our own potting shed, where our amazing volunteer crew uses it as one of their main reference guides for their work in propagating native plants. In our case, reading locally extends quite a bit beyond the Annapolis Valley! As we know, the natural world doesn’t pay attention to federal or provincial boundaries. The Acadian Forest Region extends well into New England and there is much work being done “south of the border” to understand local forest communities. I was able to spend time with several of the staff members at The Gardens, including Melissa Cullina, the research botanist on staff and William’s wife. We officially decided that we work for two branches of the same organization, one that is devoted to instilling awareness and amazement in humans of the miraculous world of plants. Melissa and William are currently working on a new publication specific to the flora of Midcoast Maine, a unique and interesting eco-region. Considering the diversity of ecosystems found in Nova Scotia as well, perhaps one day we will have separate field guides for each of our native habitats! In my opinion, there can never be enough books to help us understand the beautiful green world around us. I can’t wait to get my hands on a copy of Midcoast Flora, whenever William and Melissa finish their massive project! As a token of gratitude, what better gift from one botanical garden to another: a field guide from the collection on offer at the Irving Centre. Melissa was thrilled to receive a copy of Trees and Shrubs of the Maritimes by Tod Boland and add it to their public library. Reading locally within the Acadian Forest Region means that sometimes a little bit of travel is in store, but it’s always well worth the journey! Happy reading! 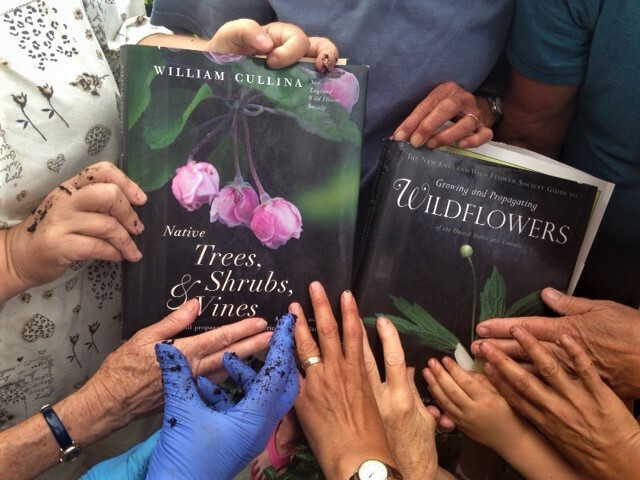 Photo caption: The Friends of the Gardens volunteer group proudly display their dog-eared, well-loved copies of William Cullina’s books while hard at work on a Tuesday morning.